Turbo compressors main pageTouch-FreeOil-FreeCare-FreeProduct rangeSavings calculatorWhere is the money? Clean, oil-free compressed air is important in many industries but nowhere is it as critical as in food and beverage processing. Air is used from powering pneumatic cylinders and actuators, moving food materials and processing the ingredients to pneumatic sorting of produce. For years, companies have had to rely on 60 to 100+ year old compressor technologies which use oil in one form or another, opening a possibility of oil or other harmful components ending in what we eat or drink. These technologies are forced to use filtering which increases the total cost of ownership when the maintenance costs of the compressor are already high. Using our air compressors, you will eliminate the possibility of oil or harmful wearing coatings in the system and reach a better efficiency compared to old technology. Our compressor creates risk-free benefits for food and beverage processing plants virtually with no maintenance. Consumer-based innovations, cost-efficiency and sustainability are key factors in the operations of HK Scan, a leading food manufacturer in Scandinavia. We want to be a benchmark in progress and use innovative solutions in all our operations. Tamturbo® compressors bring us significant benefits in achieving our energy efficiency goals. A large percentage of compressed air in food and beverage industries is produced with so called dry “oil-free” screw compressors. Surprisingly they are not really oil-free. To function, they need oil for lubricating gears and bearing and thus contain large amounts of oil. The oil is circulated with an oil pump, through oil filters and captured by oil demisters and oil seals. The oil is separated from the compressor chamber by oil seals. When compressors wear, the risk of oil getting in to air system increases. Also, “oil-free” screw compressors’ gear boxes pass fine oil mist in the ambient. To avoid this oil mist from getting into the air stream, intake air has to be either pre-filtered or ducted from a clean location, which adds costs to installation. Oil, oil filters and oil demister service yields waste, which has to be disposed properly further adding to cost of maintenance. Tamturbo compressor is 100 % oil-free. With absolutely no oil in the system, compressors are completely risk-free from oil contamination. This simplifies the downstream compressed air system and eliminates costly oil services and waste disposal. “Oil-free” screw compressor rotors are coated with PTFE compounds, generally called Teflon. Wearing releases these harmful chemicals into air stream when compressors are used. The wearing decreases the compressor’s energy efficiency and hence increases the cost of produced compressed air. The energy efficiency decreases 15% or even more in a few years and then screw compressor elements need to be replaced or rebuilt. Rebuilding the screw elements every few years is very costly. Total cost of the service will be 50% or more of a new “oil-free” compressor package cost. Large compressors are used for 15 to 20 years with multiple rebuilds and therefore the total cost of ownership becomes unnecessarily high. With no mechanical touch between moving compressor parts, Tamturbo compressors don’t wear. No wear means unchanged efficiency with virtually no need for service or even maintenance of the system. What if we used traditional turbos? Largest food and beverage plants sometime use traditional turbo compressors. This very 100+ year old technology also uses oil to lubricate gears and bearings. While the nominal energy efficiency of these compressors is better than of the “oil-free” screw compressors, they have a very narrow air capacity range. This means frequent and energy wasting blow-offs of excess capacity when the air demand fluctuates. The traditional centrifugal compressors are good for base load duties and “oil-free” screw compressors are often used for capacity trimming. Food industry accounts for 9 % of global industrial energy consumption and many companies intend to improve the energy efficiency of their production plants. Following heating and production processes, the production of compressed air is one of their most significant energy consumers. The energy consumption of compressed air varies from 15 to 20 percent of the total energy consumption, throughout the food industry. This means that compressor energy efficiency has a big impact on the total energy consumption. Tamturbo® solution will improve the efficiency and energy recovery during the whole compressor lifecycle. In total, over 90 percent of the compressor input energy can be utilized in the production process through compressor energy recovery system, which is a significant saving. Parts that don’t touch, don’t wear. All Tamturbo® Touch-Free™ Technology compressors are direct driven high-speed turbo compressors that produce 100% oil-free compressed air for industrial customers. We have absolutely no oil in our compressor. Tamturbo® Touch-Free™compressors have impellers mounted on the high-speed motor shaft while producing 100% oil-free compressed air. Maintenance-free Tamturbo® Technology makes compressed air care free. All Tamturbo® Touch-Free™ Technology compressors are direct driven high-speed turbo compressors that produce 100% oil-free compressed air for industrial customers. 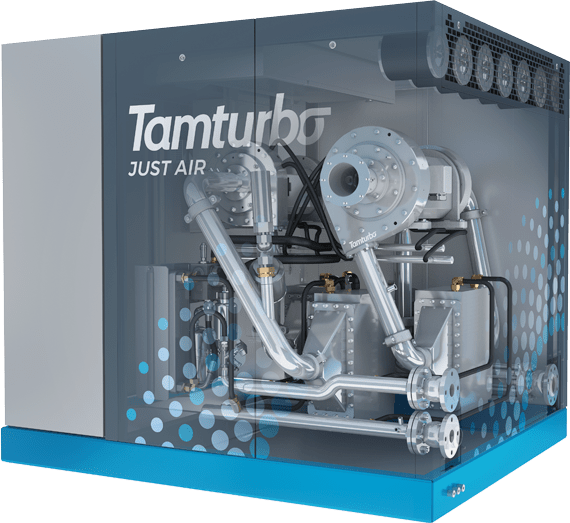 Tamturbo’s 100% oil-free and touch-free air compressors are by default care-free. Customers in Food and Beverage processing have tested and validated the Tamturbo design in multiple European locations. Extensive testing has led to multiple units sold to early adopters who have discovered that the cliché of “too good to be true” actually does not hold true in this case: Touch-Free means maintenance and service free. It means also high and unchanged efficiency. Completely oil-free design means no oil contamination, oil service or waste treatment. Combined these mean the lowest Total Cost of Ownership.